Many elementary schools provide watercolor painting classes for their young students. 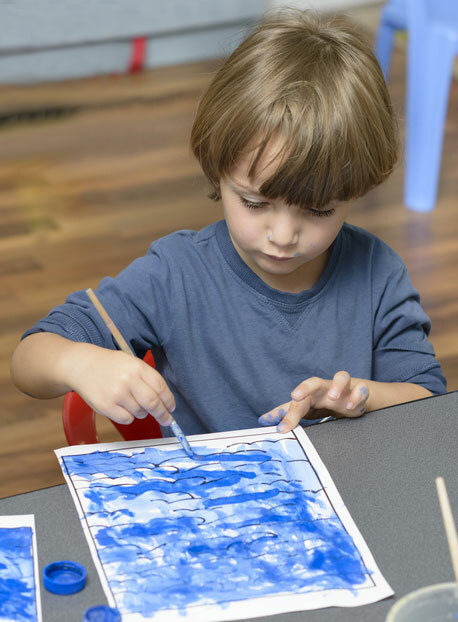 In these classes, children are introduced to watercolor paint and brushes as well as the joys and basic techniques of painting with watercolors. Artist devoted to watercolor for two decades. Annmarie Garden is a thirty acre public sculpture park located in scenic Solomons, MD. open daily year-round. The Garden also offers art classes, special events, exhibits and gallery shows throughout the year. Carole is an AWS artist. This award winning watercolor artist is a member of the Kentucky Watercolor Society. Imagine - in about 2 hours, painting one of the fun art pieces shown from our calendar? PSAA is a non-profit art organization located in Manahawkin, NJ. Classes, workshops, art demonstrations, and exhibits are featured. Classes available for Children and Adults; beginner & intermediate levels. Local professional artist with 30 years teaching experience in Fine Art. Step by step instruction with frequent demonstrations in all techniques necessary to complete your watercolor paintings. Ongoing classes available at studio on Monmouth/Ocean County border (overlookiing the Metedeconk River), and other venues. Or schedule a group at your comunity/venue; or private lessons in your home. Always a relaxed enviornment, with a theraputic atmosphere that welcomes all ages and levels. Recieve the tools that will enable you to paint for the rest of your life. No experence necessary....just desire. I paint portraits in watercolor as well as landscapes. Especially those of lighthouses and seascapes. Beginning classes are also available.